D.1-5)Study the following information carefully and answer the given questions. 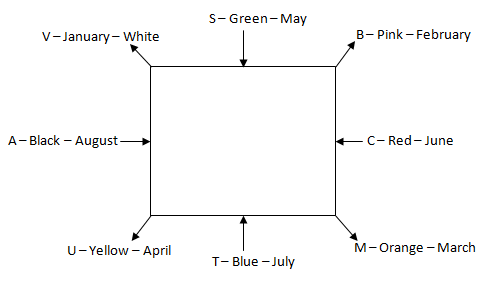 R, N, S, M, Q, A, P and T are sitting around a square table, in such a way that four of them sit at four corners of the square facing outside the table while four sit in the middle of the four sides facing inside the table. And each of them studies in different standard I, II, III, IV, V, VI, VII and VIII. 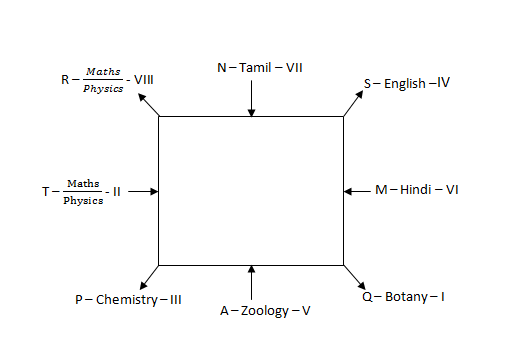 Each of them likes different subject Physics, Chemistry, English, Mathematics, Hindi, Botany, Zoology and Tamil, but not necessarily in the same order. N sits immediate left of S, who likes English. There is only two person sits between N and P who likes chemistry. P is facing away from the centre. Neither Q nor R is an immediate neighbour of P. M is facing inside the table. There are as many person sit between S and P as between N and A, who is studying in V standard. The one who is studying in V th standard is an immediate neighbour of Q who likes botany. T is studying in II standard and is not an immediate neighbour of S and N. M is studying in VI standard and likes Hindi and is not an immediate neighbour of P. There are as many person sit between A and Q as between R and N who likes Tamil. The one who likes botany sits opposite to the one who is studying in VIII standard. N does not study in Standard I and Standard IV. The one who likes mathematics and the one who likes physics are immediate neighbours of each other. T does not like zoology. S does not study in I standard. P is studying in III standard. Q.1) The one who is studying in standard II likes which of the following subjects? Q.2) How many persons are sitting between S and the one who is studying in VI, when counted from the right of S? Q.3) If the person who is studying in VIII standard likes physics, then which of the following person like maths? Q.4) Who among the following person sits to the immediate left of the one who is studying in IV standard? Q.5) Four of the following five are like in a certain way, find the one which does not belong to the group? S, T, U, A, B, M, C and V are sitting around a square table, in such a way that four of them sit at four corners of the square facing outward of the table, while four sit in the middle of the four sides facing the centre of the table. Each of them likes different colour viz. Pink, Red, Orange, Blue, Yellow, Black, White and Green. Each of them born in different months January, February, March, April, May, June, July and August born in the same year. The person who was born in the consecutive month will not sit together. (E.g. If the person was born in January is not an immediate neighbour of the person who was born in February). All the above information is not necessarily in the same order. V was born in January and is an immediate neighbour of A and S. C likes Red and was born in June. The one who was born in April sits opposite to the one who likes pink. V sits at one of the corners of the table. C is facing inside. A was born in August. M is an immediate neighbour of the one who was born in June and T. M was born on the month which has more than 30 days. U likes yellow and was born on the month which has 30 days and is not an immediate neighbour of C. The one who likes pink was born in less than 30 days. T likes blue and sits opposite to the one who likes green. V likes neither black nor orange. The one who was born in March sits immediate left of C. M does not like black. Q.6) Who was born on July month? Q.7) Which of the following person is an immediate neighbour of the one who likes pink? Q.8) Four of the following five are like in a certain way. Which one of the following does not belong to the group? Q.10) How many persons are there between the one who was born on August and the one who likes Pink, when counted from the left of the one who was born on August? D.11-15) Read the following information carefully and answer the questions given below. Q.11) If all the numbers are dropped from the above arrangement then, which of the following element will be sixth to the right of tenth from the left end? Q.12) In above sequence how many such numbers are there in each of which numbers are immediately preceded by a vowel and immediately followed by a symbol? Q.14) In the following series what should come in place of question mark? Q.15) In the following four of the five are alike in certain way based on the position in the arrangement, find which of the followingdoes not belong to the group? Q.16) Which of the following is eleventh to the right of fifth from the left end? Q.17) How many alphabets are there between O and the element which is 15th from the left end? Q.18) How many numbers are there in the arrangement which is immediately followed by a symbol? Q.19) If all the vowels in the arrangement is replaced by next letter and the consonants are replaced by a previous letter in the alphabet series then, how many vowels are there in the new arrangement? Q.20) Four of the following five are alike in a certain way based on the arrangement and hence form a group. Which one of the following does not belong to the group?